There are many critics in the UK of the practices connected to producing Halal and kosher meats. Most of these criticisms are based around the actual slaughter methods involved and the potential harm and suffering this causes the animals. There are both differences and similarities in the arguments and rules surrounding Halal and kosher meats. Halal refers to anything that is permissible under Islam, with over 70% of Muslims following Halal beliefs. In Arabic speaking countries, Halal refers to a number of standards, including behaviour, speech and clothing. In non-Arabic speaking countries, the word Halal more often refers only to food practices. The definition of Halal meat is that it must not be a forbidden substance and all animals must be slaughtered according to traditional guidelines. It is these guidelines that are causing a number of organisations, including the Farm Animal Welfare Council (FAWC) to openly suggest that the practice should be banned as it is cruel to animals. They include the key rule that the animal must be killed with a single cut to the throat, rather than the more human practice of stunning the animal quickly and effectively so that it does not feel any pain. After the single cut, the animal can take a full two minutes to be properly dead, which can mean that the animal is aware of what is happening to them in that time. The forbidden substances include pork or any products which are pig-based, such as gelatine, blood or blood products, such as black pudding, animals slaughtered in the name of anyone but God, all intoxicants (especially alcohol), carrion, which is the carcasses of dead animals and 'fanged beasts of prey', which refers to carnivorous animals. It is acceptable to have alcohol used in cooking as long as it is all burned off in the cooking process. Halal products are widely available, with MacDonald's in the US offering Halal chicken nuggets. These are also provided in Muslim areas such as Singapore, Malaysia and South Africa, with two UK outlets currently trialling Halal products. Kosher meats are killed using the same methods, so they are often subject to the same criticism, although the beliefs are different. 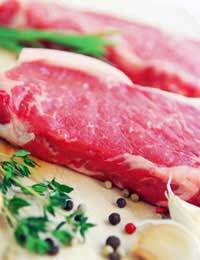 Kosher meat must conform to Jewish law, with the slaughter of animals playing a large part in that, alongside rules regarding not allowing the mix of meat and milk, wine or grapes. It is also not acceptable to have food produced by gentiles, or non-Jewish people. It is very difficult to have an open discussion or debate on the practices of Halal and kosher meats because of the religious implications. While people are entitled to live by the rules of their religion or indeed anything the see fit, animal welfare campaigners are keen to end slaughter practices that are harmful to animals regardless of religious reason. In recent years, the slaughter methods of such religious practices have been subject to closer scrutiny, with the treatment of animals playing an important role in the 'realistic' debate, rather than religious entitlement simply coming first.